The Knucklehead is a spider-like robot built by Baxter Stockman. It first appeared in the 1987 series episode Enter The Fly as Shredderused it against the Turtles, but the Turtles quickly defeated it. 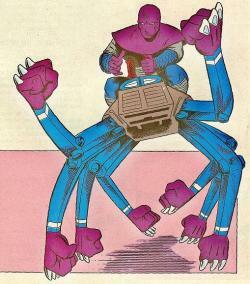 It would later appear in Casey Jones: Outlaw Hero where it is used byKrang. It also appeared in the Teenage Mutant Ninja Turtles Adventures comics in issue 9 where it was used by a Foot Soldier. In the series Shredder names the device in honor of Bebop, thus giving it one of names he uses to insult the mutant.